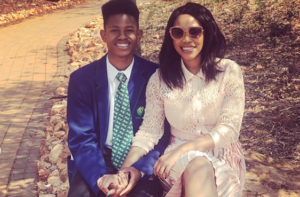 Pics: Sonia Mbele Goes All Out For Her Son’s Matric Dance. Just the other day he was announced an SRC member, now it’s his Matric dance. They grow up fast don’t they. Sonia Mbele made sure her son gets the best send off fit for a Prince. It didn’t start off well though with designer drama. Mummy dearest saved the day, and made sure everything goes according to plan for her first born son.